4 M.M. Bakhtin, The Dialogic Imagination, p. 243. 6 M. Procházka, Ζ. Hrbata, Romantismus a romantismy, p. 111. 1The plots of time-travel stories for children draw in many ways on an old epic tradition; in particular on the theme of the quest2 and the related idea of the journey. The importance of this specific narrative situation has been discussed by M.M. Bakhtin in his analysis of chronotopes (i. e. structures of relations between representations of time and space in literature), namely in his concept of the chronotope of the road.3 Bakhtin considers the connections between this chronotope and the chronotope of encounter, as well as the links to the emotional experience or, in other words, to a “high degree of emotional intensity”4 of both chronotopes. According to Martin Procházka, a correspondence can be found between Bakhtin’s analysis and some features of modern aesthetic concepts, especially the concept of intensity in the philosophy of Gilles Deleuze.5 For example, Bakhtin’s concern with the accidental character of the journey can “partly appropriate” Deleuze’s and Guattari’s ideas of “heterogenous structures drawing on the flows of energy and desire.”6 As Bakhtin puts it, in the epic literary tradition the journey makes it possible to intertwine spatial and temporal successions of human lives, becoming a central point and setting of events, and is especially favourable for the depiction of accidental events, incidents, and chance meetings. 7 Zdeněk Hrbata, Romantismus a Čechy (Romanticism and the Czech lands), Prague 1999, p. 16. 8 Cf. M. Procházka, Ζ. Hrbata, Romantismus a romantismy, p. 101. 3In time-travel stories, the desire to exceed the limits of a commonplace and present reality becomes a crucial element of the adventure plot and is echoed both in the description of space as well as in characterisation. In accordance with the discussed epic tradition, these journeys are connected with either an obvious or a hidden meaning, idea or value, with a task or even a mission8 aimed at rediscovering the lost links between the chronologically separated worlds and events. Experienced encounters, however accidental, bring the heroes nearer to the fulfilment of this task, to the recognition of invisible but also inviolable ties between particular people and their situations, defying any temporal distance. 4Following this theoretical context, my discussion is concerned with stories describing the child heroes’ encounters with their ancestors; either members of the same family (The House of Arden by Edith Nesbit, A Traveller in Time by Alison Uttley, the Green Knowe series by Lucy Boston, Playing Beatie Bow by Ruth Park, or a Czech children’s story Stoletá holka/A Hundred-Year Old Girl/by Jana Knitlová), or just the people from the past, whose lives, however, seem to be intertwined with the lives of the heroes (Tom’s Midnight Garden by Philippa Pearce, Penelope Lively’s The House of Norham Gardens, Catherine Storr’s The Castle Boy, or Jacqueline Wilson’s The Lottie Project). 5In these stories, the journey is usually initiated by the notion of a split, a rupture between the past and the present, and also between the inner world of the individual and the outer world of his surroundings. This experience of discontinuity and estrangement involves both the feeling of loss and the desire for reunion and can be also applied to the historical contexts of the stories, e.g. the frequent references to the disturbing events of English and European history, or to particular situations of disharmony, uncertainty and unrest (the horrors of the First and the Second World Wars in the Green Knowe series, Tom’s Midnight Garden, The Castle Boy or the disturbing influence of communism in Jana Knitlová’ s story). 6The feeling of displacement intimated by background references to wider socio-cultural contexts is intensified in the descriptions of the more pronounced, personal conflicts of the child heroes themselves. The notion of security and reliability of the original home may be challenged by a number of motifs, ranging from the loss of one or both parents through an imposed separation from the family to the confrontation with a possibility or inevitability of various kinds of change. These motifs include the experience of death (Lively’s The House of Norham Gardens), illness (Hilda Lewis’s The Ship that Flew) or some impending danger (Diana Wynne Jones’s A Tale of Time City), divorce (Parker’s Playing Beatie Bow), an intrusion of a step-parent (Pearce’s The Children of Green Knowe, Wilson’s The Lottie Project), homesickness (Penelope Farmer’s Charlotte Sometimes, Pearce’s Tom’s Midnight Garden), or even the birth of a new sibling (Jana Knitlová). 7It is the encounter with the temporality and fragility of the individual existence, with the transitoriness of particular situations as well as values that leads the heroes to the changed perception of time and space. And it is this experience that helps the time-travellers to cope with the problems of their everyday life by facing the magnified variations on these conflicts within the “other” worlds of their timeslip adventure. 8As the discussed stories suggest, there is a striking similarity between the events of the past and the present: When the child heroes enter the worlds of the past, they follow their desire to escape from a disagreeable situation and from troubled relationships. Paradoxically, they set out on the journey towards what they fear and reject. After his mother’s death and through a time-travel experience, Boston’s Tolly learns about a mortal disease destroying the family of his ancestors. Catherine Storr’s Robert almost dies in the same fire that killed his father struggling to rescue people from a burning hotel during the war. Parker’s Abigail, suffering from the absence of father, encounters the tragic consequences of this absence in the family of her long dead relatives; Wilson’s heroine Charlie projects a torturing feeling of guilt on to the story of a Victorian servant maid, and Pearce’s Tom, depressed by his brother’s illness and by a temporary separation from his family, has to face a greater loneliness and a deeper anxiety in his friendship with an orphaned girl from the 19th century. In Jana Knitlová’s story, the hero searches for the idealised world of the past to experience a life and death conflict in his encounter with a criminal. 9 M.M. Bakhtin, The Dialogic Imagination, p. 146-151. 9In this respect, the space of the past becomes a space of initiation, and its significance is highlighted by the employment of a “temporal inversion”9; in other words the suggested correspondence between what happened a long time ago and what is to be achieved. The descent into the past, including a trial of pain and terror, makes the heroes face the traumas expelled from everyday life (or a conscious memory), live through them and, by breaking their destructive force, accept the possibility of a new beginning. 11 Cf. J.L. Weston, From Ritual to Romance, p. 11-22. 10To unfold particular levels of experience in the life of different generations, the discussed authors develop the following concept of the magic journey: the heroes passing through years and centuries are simultaneously moving within the limits of one particular space. It is the place that initiates and determines the passage, gradually revealing the various hidden levels of its temporal existence. And it is this connection that is highlighted in a number of titles (The Castle Boy, The Children of Green Knowe, Tom’s Midnight Garden), being suggested especially by the recurrent image of an old house. Old and ancient buildings (quite in accordance with Gothic and Romantic imagery) assume the role of the connecting links with the past, being permeated with “historical time”, with both visible and invisible “traces” of the “previous generations.”10 Or, in other words, with the traces of life, which (regardless of particular difficulties of this life) may help to subdue the anxiety of impending emptiness following the violation of the temporal continuum through which the experience of generations used to be transmitted (the frequent motifs of dead parents or children). The feeling of animation, of the presence of the past, may be suggested by personification and metonymy: In Tom’s Midnight Garden, the house “sighs”, “whispers” and “speaks” to the hero, inviting him to reveal its secrets. The hero is involved into an exciting dialogue, being snatched away from his world and carried along towards the world of the other, which, in return, leads him to a changed perception of his everyday surroundings. The beauty of a former garden may be revived in the “narrow space” of a “stone and metal” yard, and, accordingly, a kind-hearted nature and a youthful mind can be recognised behind the peculiar manners of an old landlady. A similar play of suggested questions incites the feeling of revival in Children of Green Knowe: a motherless boy moves to his great grandmother’s house, filled with mysterious shadows, whispers and movements, and gradually forgets his loneliness in sharing the exciting adventures of the children from the past. In Stoletá holka, particular buildings “look in each other’s eyes”, entering into an exciting enquiry concerning their nature and origin, and involving the passers by (as well as their ancestors) into a “gripping game” of question asking, which, in accordance with the Quest tradition, seems to incite the restoration of the continuity of life11. 11The connection with the past is evoked in the similarity of particular events (the discussed motifs of illness, separation, desire) but also in the recurrence of names, physical features and individual qualities (e.g. in Lucy Boston or in Jana Knitlová, whose girl from the past repeatedly mistakes her future grandson for her childhood friend and her future husband). 12 Cf. G. Deleuze, Nietzsche and Philosophy, New York, 1983, p. 2-38. 13 G. Deleuze, Difference and Repetition, London, 1994, p. 287. 14 G. Deleuze, The Logic of Sense, New York, 1990, p. 4-5. 15 Cf. G. Deleuze; F. Guattari, A Thousand Plateaus, London, 1996, p.
12The notion of circular movement suggested by the discussed time travel stories seems to correspond with Nietzsche’s idea of the eternal return,12 the process that repeats eternally, the cyclical temporal structure without a beginning or end, a distinct past, present and future. However, the employment of repetition in these stories reminds us rather of Deleuze’s attempt to overcome the traditional nihilism of circular time by requiring repetition to be thought for itself and not in subordination to the same or the identical.13 For Deleuze, pure repetition, or repetition for itself, triggers other repetitions, produces difference and allows for the new. Deleuze’s alternative to a circular time draws on a cut in time which occurs during pure repetition and separates the present from the past for a new future to be possible. The time of this cut is referred to as Aion: a void time and an “entity infinitely divisible into past and future”;14 a line that interrupts the circle and encompasses both what is past and what remains to come, while any point of this line can be linked to any other at any moment. This concept of time corresponds, in fact, with Deleuze’s idea of a smooth space15, the space of free movement and of imagination, the boundless space of constant becoming. 13Accordingly, the journeys in time-travel stories are marked by accidental directions, chance meetings and the variety of links connecting particular stages of the journey; while the travel is initiated by the points of similarity between these stages (e.g. Tom’s separation from his family, the lonely childhood of Hatty, and the lost children of Mrs Bartholomew in Tom’s Midnight Garden). Thus the repeated incidents transcend spatial locations as well as temporal successions and can be related to various events and emotional concerns of the past as well as the future. In Tom’s Midnight Garden, for example, the hero’s escapes to the 19th century do not involve only his sharing the story of a Victorian girl but also (and especially) the possibility of his unexpected friendship with the old landlady. In The Children of Green Knowe, Tolly’s fear of the cursed tree does not only echo the series of the family tragedies but represents a new experience, modified by particular encounters (including the children from the past) and resulting in the hero’s changed perception of himself: the identification with his ancestors fills him with a newly acquired self-confidence and courage. 16 G. Deleuze, Difference and Repetition, p. 105. 14On the one hand, the idea of “the same life” played out at “different levels” initiates a notion of destiny.16 On the other hand, destiny, unlike determinism, does not deny freedom: as Deleuze puts it, “freedom lies in choosing the levels”;17 and it further reminds us of what Nietzsche calls a chance18, a possibility of a new beginning. 15Such beginnings can be discerned in the conclusions of all discussed time-travel tales. In The Children of Green Knowe, Tolly plans to ride the horse (the beloved activity of his ancestors but also the object of the curse) without the continuation of the threat (the destruction of the cursed tree). In the Czech time-travel story by Jana Knitlová, the hero’s admiration for his grandmother’s childhood and personality excites his suppressed love for the new-bom sister. In Park’s Playing Beatie Bow, the return of the heroine’s father and the appearance of a new friend may be interpreted as a response to her acceptance of the complexity of the human relationships through accidental encounters with a Victorian family. 16To sum up, the people from the past (as well as the memory of old people, e.g. in Tom’s Midnight Garden) do not only involve the heroes into the time-slip adventure but can simultaneously influence the heroes’choice of the ’level’ of their stories. In other words, they help to fill the empty space and the void time of repetition with the moment of expectation, the feeling that nothing will be the same again. The great grandmother of Jana Knitlová’s hero, for example, leads him to recognise his personal responsibility for his life, or, in Deleuze’s terms, for the way the life of his ancestors is being replayed. 19 G. Deleuze, The Logic of Sense, p.
17In this respect, the discussed stories can be read as literary variations on Deleuze’s (as well as Nietzsche’s) idea that being is becoming and everything that exists only becomes and never is. The value of becoming, together with the denial of finality, is, moreover, included in the theme of childhood itself, in the concern with openness, constant change and possibility. A crucial role in the process of becoming belongs to particular encounters and relationships, which bring out the heroes’ hidden characteristic features, their emotions, propensities, abilities and weaknesses. And special emphasis seems to be laid on the relationship between children and their ancestors, on the past and future that “inhere in time and divide each present infinitely”19 to open space for a liberated and hopeful movement towards a new experience. BAKHTIN Mikhail Mikhailovich, The Dialogic Imagination, ed. M. Holquist, trans. C. Emerson and M. Holquist, Austin, University of Texas Press, 2004 (Voprosy literatury i estetiki, 1975). BOSTON Lucy, The Children of Green Knowe, New York, Harcourt, Brace and World, 1955 (1954). DELEUZE Gilles, Difference and Repetition, trans. P. Patton, London, Athlone Press, 1994 (Différence et répétition, 1968). The Logic of Sense, trans. M. Lester, New York, Columbia University Press, 1990 (Logique du sens, 1969). Nietzsche and Philosophy, trans. H. Tomlinson, New York, Columbia University Press, 1983 (Nietzsche et la philosophie, 1962). DELEUZE Gilles, GUATTARI Félix, A Thousand Plateaus. Capitalism and Schizophrenia, dans. Β. Massumi, London, The Athlone Press, 1992 (Mille Plateaux, 1980). HRBATA Zdeněk, Romantismus a Čechy (Romanticism and the Czech lands), Praha, H & H, 1999. PROCHÁZK. A Martin, HRBATA Zdeněk, Romantismus a romantismy: pojmy, proudy, kontexty (Romanticism and romanticisms: concepts, currents, contexts), Praha, Univerzita Karlova, 2005. WESTON Jessie Laidlay, From Ritual to Romance, Mineola, New York, Dover Publication, Inc, 1997 (1920). 2 Particular transformations and modifications of the guest story, focusing on the search for the Holy Grail, are analysed in Jessie L. Weston´s study From Ritual to Romance (1920), exploring the origins of the Grail legend. 3 Cf. M.M. Bakhtin, The Dialogic Imagination, Austin, 2004, p. 243-250, and Martin Procházka, Zdenëk Hrbata, Romantismus a romantismy (Romanticism and Romanticisms), Prague, 2005, p. 110-112. 5 M. Procházka, Ζ. Hrbata, Romantismus a romantismy, p. 110. The authors refer to Deleuze´s emphasis on intensity as a crucial quality of a work of art as discussed in Difference and Repetition (1968). After receiving her Ph. D. has taught in the English Department of the University of South Bohemia, where she lectures in English literature, American literature, children’s literature. Her present research covers the field of Anglo-American gothic and romantic literature and its impact on contemporary fiction as well as literary criticism and theory. VRÁNKOVÁ, Kamila. ‘Emptiness and Expectation’: Difference, Repetition and Memory in Time-Travel Stories for Children In : Stories For Children, Histories of Childhood. Volume II : Literature [en ligne]. Tours : Presses universitaires François-Rabelais, 2007 (généré le 25 avril 2019). Disponible sur Internet : <http://books.openedition.org/pufr/4950>. ISBN : 9782869064836. DOI : 10.4000/books.pufr.4950. Vránková, Kamila. “‘Emptiness and Expectation’: Difference, Repetition and Memory in Time-Travel Stories for Children”. Findlay, Rosie, et Sébastien Salbayre. 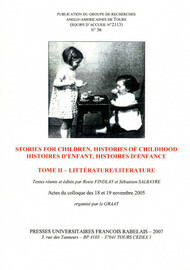 Stories For Children, Histories of Childhood. Volume II : Literature. Tours : Presses universitaires François-Rabelais, 2007. (pp. 119-126) Web. <http://books.openedition.org/pufr/4950>. FINDLAY, Rosie (dir.) ; SALBAYRE, Sébastien (dir.). Stories For Children, Histories of Childhood. Volume II : Literature. Nouvelle édition [en ligne]. Tours : Presses universitaires François-Rabelais, 2007 (généré le 25 avril 2019). Disponible sur Internet : <http://books.openedition.org/pufr/4932>. ISBN : 9782869064836. DOI : 10.4000/books.pufr.4932.